This is the magical story of a young King who lives all by himself in a wonderful kingdom. In order to stop feeling bored, he decides to create for himself a dream world filled with interesting characters and mesmerizing distractions. After he sees how much fun everyone is having in his imaginary world, he puts on a disguise and joins the players for himself. However, as he gets more and more entranced by his own drama, he slowly forgets that he's only been playing a fascinating game with himself, and that he's actually the One-and-Only King who has created It all! 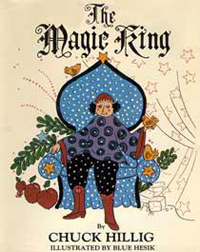 A magical, enchanting allegory for Kids of all Ages!